"Leaders don't create followers, they create more leaders"
Ethics, also known as moral philosophy, is a branch of philosophy that involves systematizing, defending, and recommending concepts of right and wrong conduct. The India's Most Ethical Companies (6th Edition) is a humble initiative, mainly aims to recognizing Companies and people whose behaviour in a socially responsible manner is much more likely to enjoy ultimate success than those whose actions are motivated solely by profits. Knowing the difference between right and wrong and choosing what is right is the foundation for ethical decision making. In many cases, doing the right thing often leads to the greatest financial, social, and personal rewards in the long run. The India Most Ethical Companies Awards recognizes organizations that understand the importance that permeates throughout an entire community of employees, customers, investors and the public at large when words about ethics, compliance and good governance are translated into action also those organizations that have had a material impact on the way business is conducted by fostering a culture of ethics and transparency at every level of an organization. Mr. Ajit Pattnaik, a Post Graduate in Management from Jamnalal Bajaj Institute of Management Studies, Mumbai, has multi-disciplinary experience across social development, business ethics, public relations, media, human resources management and corporate social responsibility (CSR) fields. Mr. Pattnaik, as General Manager (Corporate Sustainability) has been heading CSR & Sustainability of Tata Housing Development Company Ltd for more than three years. He has earlier headed CSR in Tata Communications Ltd and has also served under Government of Odisha and Government of India under various capacities. Mr. Pattnaik in his career spanning more than three decades, had the opportunity of serving the poorest of the poor and socio-economically backwardcommunities by empowering them through educational and skill development programmes in the remotest regions of India. As a corporate strategist and sustainability thought leader he has been instrumental in integrating CSR strategies with the business strategies of organisations. Col Prakash Tewari (Retd) is the Group Vice President, CSR and Education of the Jindal Steel and Power Limited(JSPL). JSPl has operations in Steel, Power, Mining, Reality, Infrastructure Development, and IT. He is responsible for running of Higher Education (Universities, Engineering, Medical Colleges), Secondary Education, (Schools), Vocational and Skill Training Institutes, ( Community Colleges, ITI, ITC), Jindal Fortis Hospitals, CSR and all Foundations of the Group. The Group has its operations in Asia, Africa, Middle East, Australia and USA. Prior to this he was the Head of Tata Power CSR, Rehabilitation and Resettlement. He has been awarded the United National Educational, Scientific and Cultural Organisation (UNESCO) - Global Alliance for Disaster Reduction 2005 Award for distinguished professional leadership and personal commitment to ongoing programs in Asia. Since the last three decades has been working in the field of social, environmental, disaster, education and conflict management. He has served in various Government Ministries, International organizations and leading Corporates. He was the Chairman CSR Committee, Bombay Chambers Of Commerce and Industries, Board and Vice President, Global Alliance for Disaster Reduction, USA, Member Working Group Indian Ocean, University of Melbourne, Australia, Member, Uttrakhand Centre for Climate Change, Kumaon University. As Director Policy Ecology he was the representative of the Ministry in the National Board for Wild Life, Indian National Trust for Arts and Cultural Heritage and National Afforestation Ecology Board. He was selected by Rotary International and Rotary Foundation for Conflict Management Course in Chulalongkorn University, Bangkok where he carried out assessment of Environment and Resource based conflicts due to infrastructure developments projects in SE Asia. His case studies have been published in Harvard Business Review, IIM Bangalore, OIKAS Foundation, Corporate Sustainability Track and World Sustainable Economy Forum. He has also been addressing International Conferences and conducting CSR workshops for various Corporates in SE Asia and Middle East. He has published and presented number of papers in International Conferences in Asia, Australia, Europe, USA, Africa, Middle East, Newzealand, Iceland, Japan and Korea. A Marketing and communications professional with over two decades of rich experience, spread across financial services, telecom, NBFC, FMCG and cement. Hands on experience in product and corporate branding, go-to-market strategy, advertising, media planning & buying, digital& social media and PRwith a mix of experience of working with both corporate as well as communication agency. Building a purpose-led organizational brand and aligning product brands to the corporate purpose has been the fundamental scope across my career span. I have been responsible for initiating, overseeingand executingmarketing campaigns, product launches, promotional events/activities, sponsorships/alliances, development of positioning / messaging and provide PR counsel to internal clients, manage expectations and educate as necessary. Mr. Amandeep Singh has been leading the Corporate Communication as well as CSR functions of Indraprastha Gas Limited (IGL), the largest CNG distribution company of the country for over a decade. Mr Singh is a double post graduate in Management as well as Mass Communication backed by a specialized programe in Trade Fair Management from Germany. He possesses over twenty three years' Communications, Marketing and CSR experience in reputed Trade Promotion, Media and Business organizations in public as well as private sector in India. After joining IGL in 2005, he has successfully led the design, development and execution of communication plan of the organization that has led to wide popularity of CNG as a fuel in all vehicle segments and of Piped Natural Gas, as the most preferred kitchen fuel, across National Capital Region (NCR). The successful introduction of CNG in Delhi by IGL leading to drastic reduction in pollution levels has been applauded worldwide. Mr. Singh has also had a wide international exposure in the field of Trade Fairs having worked for a decade with leading Trade Fair organisers of the country like ITPO and CII. Nonika is a founder member and heads Corporate Social Responsibility and Sustainability for Canara HSBC Oriental Bank of Commerce Life Insurance Company. She joined the Company in 2007 as part of the project team responsible for the launch of the business in 2008. During her tenure she has looked after Corporate Communications and also led Research, Rural vertical, Internal Communications and CSR for the Company. In her current role, Nonika spearheads the CSR and sustainability programme of the Company with a focus on the environment, inclusive growth though education, vocational & skill training and cleanliness & sanitation. Her core work includes formulation of the CSR strategy and project planning to generate value by adopting a long-term sustainability approach with employee volunteering programme being the bedrock of all projects and initiatives. She also leads the resource mobilization and recycling programme for the organization. 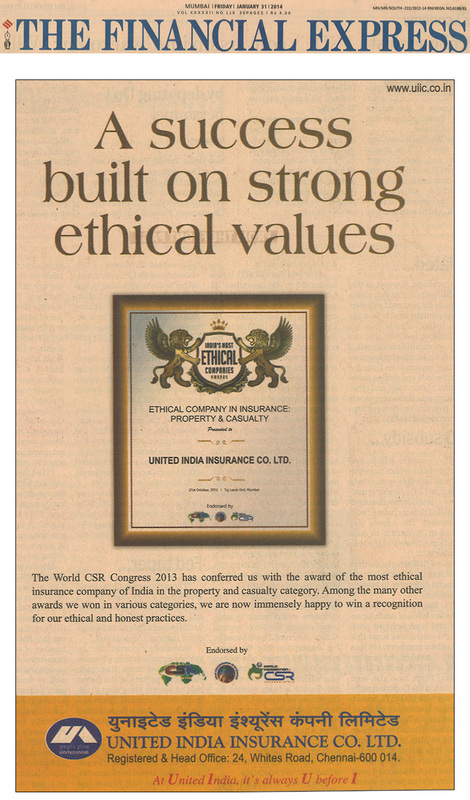 The Company has also won the "Most Socially Responsible Insurer" award at The Indian Insurance Awards 2015. She is also a core group member of the Diversity and Inclusion team. Nonika has 18 years of well-rounded, multicultural experience in education, marketing, communication, content management, training & e-learning, CSR and journalism. She has worked with organizations like Amity, INTACH, Dr Reddy's, Escorts Group and Max New York Life Insurance before joining Canara HSBC Oriental Bank of Commerce Life Insurance. Nonika is a graduate in History from Hindu College, Delhi University. She is post graduate in Journalism, Mass Communications and PR and holds a PG Diploma in Instruction Design from Symbiosis. Besides this, as part of executive education, she has attended 'Women in Leadership' mentoring programme by Interweave and General Management Programme at ISB, Hyderabad. She is also a trained teacher and holds certifications in Guidance and English. Strategic partner and consultant in various Healthcare and pharmaceutical companies&Director at Prometheus Healthcare Solutions & Saarathi Healthcare Pvt. Ltd.
Mohit Tamhankar is a management graduate from K.J.Somaiya and has more than 18 years of experience in sales, marketing, training, business development and clinical research. He has worked in various companies like Serdia, Novartis, UCB and J&J, and scaled the levels from the grass-roots, from a Representative to a Director position. In his past experience Mohit has launched brands, teams, different business units, and was responsible for P&L as well. The experience nurtured him into a strategist by profession, and he plays a vital role in maximizing the resources of the organization, in terms of people, collaboration, and future business. He is a strategic partner &consultant in building various business models around patient programs, disease management, point of care products, educational programs, & innovative digital solutions. Mohit is a trainer/orator/mentor and possess excellent knowledge in related subject of Healthcare industry. Mohit loves travelling and reading in his spare time. With almost three decades of experience in Business Management and Corporate Affairs in large Indian and global organizations, he has been instrumental in institutionalizing Stakeholder Relations, Risk Assessment, Crisis Management, CSR and Sustainability practices within Corporates and across Industries. Praveen has contributed to the development of Corporate Affairs, Corporate Governance and CSR by engaging several Fortune 500 companies, small & medium enterprises (SME) and management institutes. His professional experience is associated with names like MGF, Tata vehicles, Joint American Indo Network, News channel - Jain TV and Coca-Cola India and South West Asia. Praveen was Chief of Corporate Affairs of Hindustan Coca-Cola Beverages before he joined the SWADES Foundation as its Chief Operating Officer. At Coca-Cola, he looked after Community Engagement (Citizenship/CSR/Sustainability/Crisis response) for India and South West Asia for Coca-Cola. Providing strategic framework, including Vision, Policy, broad direction on projects, NGO partnerships, Project implementation, communication, capacity building of operations teams across 70 manufacturing locations in South West Asia (India, Bangladesh, Nepal, Maldives, Bhutan, Srilanka). He has steered partnerships with International NGOs- UN Habitat, Habitat for Humanity, Rotary International, WWF, ICRISAT, with over 100 national NGOs including Red Cross, AFPRO, CAF, Save The Children, World Vision, Plan, FORCE, Rotary, BAIF etc. and numerous grassroots NGOs. He has contributed substantially to Reputation management as well as Stakeholder engagements i.e. Trade bodies, consumers, communities, CSR, NGOs, INGOs, select Governments, local self-governments and political leadership at several levels. Praveen has been a member of CII's National Education Committee, CSR committee of CII for North India, Water committee of FICCI, Environment committee of FICCI, CSR council of AMCHAM besides being nominated on independent advisory board of an International NGO's Indian operations. He continues to assist CII in several regional and National committees/councils. Felicitated with the "HR Super Achiever Award" by Star News at the 20th World HRD Congress 2012, Aparna is a passionate learner in her journey of over 19 years of intense and expansive HR work. In her diverse roles, Aparna has successfully been a learning partner, mentor and coach to leaders, leadership teams and organisations to build competencies, learning abilities and nimbleness for achieving purposeful performance. After completing her post graduation in Personnel Management & Industrial Relations (PM & IR) from Tata Institute of Social Sciences (TISS), Mumbai, Aparna made her foray into the corporate world through Nocil and moved into different roles in the HR function in organisations like Monsanto, Novartis, UCB, Deutsche Bank, Lafarge & Greaves Cotton. Over the years, Aparna has learnt to persistently and passionately value freedom, authentic relationships and realization of potential of people. Winner of many accolades like 'Women Leadership Award' for BFSI (Banking, Financial Services & Insurance) Awards by Institute of Public Enterprise (IPE), Hyderabad, 'Achiever of Excellence Award' by Bombay Management Association (BMA) & Indian Society for Training & Development (ISTD, Mumbai), '30 Women Achievers Award' by HRD Congress 2013, she has also featured as one of the top women HR Leaders in the country in the anniversary issue of Business Manager, July 2012 & quoted as a Thought Leader in HR. Under her leadership at Lafarge, many in-company Global Awards such as 'Digilearn Championship Trophy' & 'WAVE' (Women Adding Value & Excellence) have been received besides external recognitions like CLO (Chief Learning Officer's) Award consecutively for 3 years. Beyond her corporate role as an HR Leader, Aparna also dons the hat of HR contributor through her associations with Indian Society of Training & Development (ISTD), All India Management Association (AIMA), National Institute of Personnel Management (NIPM), National HRD Network, and Sumedhas, where she actively participates in disseminating her acquired knowledge and build the HR fraternity by creating future leaders. She was the Honorary Treasurer of National HRD Network, Mumbai Chapter (2012-2015) and a member of the Executive Committee. She was also elected as member of the National Executive Board of NHRDN for the period 2013-2015. She is also an Independent Director on the Board of T.S Alloys Ltd.(100% subsidiary of Tata Steel). A wildlife enthusiast and an amateur photographer, Aparna spends most of her leisure time closer to nature. Aparna also loves travelling as it gives her an opportunity to meet new people. Books are Aparna's favourite ally and she dedicates every day some time to read something new. An avid reader, she has a collection of some of the best books of the century. She has recently launched her maiden book, "Reality Bytes-The Role of HR in Today's World" which has received wide acclaim. On the application itself, you must send us a write-up of 2700 words gand we strongly encourage you to provide supporting documentation to substantiate your responses. The documentation we encourage to provide typically includes the type that is not easily obtainable from the public domain. This may include the documents concerning your compliance and ethics program, such as policy samples, a recent example of a training and communication plan, sample of training and/or communication materials, program reports, copies of Board minutes, conflict of interest certification form, high level org chart showing reporting lines, etc. Companies may redact information from these documents where appropriate. Process involves a more in-depth examination of the organization's Ethics Program, as well as organizational and leadership culture, governance systems and corporate citizenship efforts. Entries once sent cannot be withdrawn under any circumstances. The Organizers reserve a right to alter or change the program design without assigning any reason whatsoever. Please fill in the form below for further enquiries. © Copyright India's Most Ethical Companies Conference & Awards , All Rights Reserved.